“We are in a kind of climate emergency now,” struggling to stay below 1.5°C of warming, to avoid radical climate destabilization . No current policies keep us anywhere near this goal: We are barreling towards double that temperature, leaving us with a broken world. This has to change, and we have to lead: We have to Break Free from Fossil Fuels! This global climate movement initiative aims to shut down the world’s most dangerous fossil fuel projects and support the most ambitious climate solutions. In the Northwest, we are breaking free by taking on the region’s biggest carbon bomb: the Shell and Tesoro refineries at March Point in northern Washington. Combined, these facilities refine 47 percent of all the gasoline and diesel consumed in the region, and produce the largest, unaddressed point source of carbon pollution in the Northwest. They are an integral part of the system that we must change – within years, not decades. Join us for regional mobilization and a mass action outside these refineries on May 13, 14, and 15, to demand that we Break Free from Big Oil and speed up a just transition to 100 percent renewable energy. By land and by sea, we will stage creative and inspirational sit-ins, blockades, and kayaktivism. For people who prefer to not engage in civil disobedience, support roles and general opportunities for participation are essential to this action. NRRT and allied carpoolers, caravaners, and protesters risking arrest or not are traveling from Missoula, Moscow/Pullman, Sandpoint, and Spokane to Anacortes for this Break Free Pacific Northwest mass action. We hope that you can play a part in this powerful movement moment. Plans are coming together quickly: In just the last month, 2,000 people have signed the pledge, 400 are willing to engage in civil disobedience on the sea or land, and 30 groups have joined as coalition members. Break Free from Fossil Fuels is about more than one action. It is about accelerating our movement to take on and defeat the fossil fuel industry and the political powers behind it. It is time to shift the public narrative off fossil fuels to the possibilities, necessity, and urgency of a rapid and just energy transition. We encourage you to join us, as we together #breakfree! We have been away from the blog for some time and since the last posting, NRRT, like everything else in the universe, has gone through some changes. Since that last anti-coal export action in conjunction with Blue Skies and 350 Missoula, we held a rally at the headquarters of Washington Companies headquarters to shine a light on their complicity in the fossil fuel economy. Along with Re-invest folks and others, we will keep the pressure on Washington to do right by its workers by planning ahead for the end of coal export. And on that topic, Arch Coal- now having filed for bankruptcy- has also withdrawn its permit application for the Otter Creek coal tracts. Which also means no more proposal to build a rail line up the Tongue River. Both of these bits of news are awesome; development of those massive coal tracts would have been horrendous for the climate. But Arch is still digging coal (despite the bottomed out spot price) and still shipping it west through Missoula. The outdated, polluting Colstrip plant is still spewing CO2 and while King Coal is limping slowly toward his grave, Montana politicians (from both sides of the aisle) and labor unions still bow in fealty to this relic of a by-gone era. In order to help build a powerful climate movement that can defeat these fossil fuel industries, their government sponsors and their powerful ideological grip on American culture, NRRT is combining forces with 350 Missoula and others to join the Break Free from Fossil Fuels Pacific Northwest Coalition. 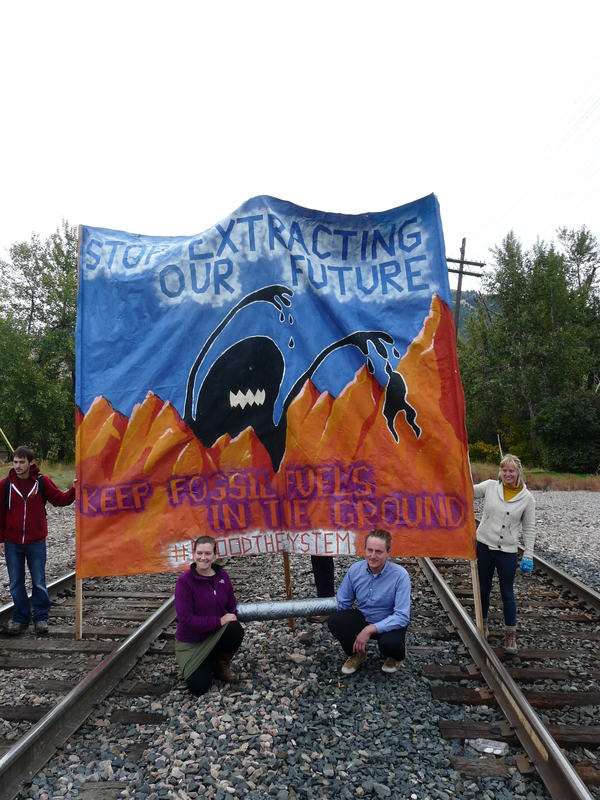 A massive action is being planned for May 12- 15 in Anacortes WA, site of two refineries and hub of Baaken oil-train transport. Through a blockade and mass civil disobedience we will shut down March Point and deliver a strong message that the end of this destructive fossil fuel based economy is in our sights. This action is in conjunction with actions planned throughout the country and the world. This is where we need to be so please help if you can. Stay tuned. solutions in the lead-up to December’s UN climate change negotiations in Paris. Two community members, Lee Van de Water and Shannon Curry, locked their arms together and refused to move for the mile long coal train. With other participants, Lee and Shannon were able to hold space on the tracks for an hour, preventing it from moving towards its west coast destination. After refusing to leave and going limp, both were cited and released for trespassing. “We refuse to let such a beautiful place be completely destroyed,” stated blockader Shannon Curry. Lee Van de Water added, “we’re acting today because no one in power has made a meaningful effort to address the extraction and consumption of fossil fuels. The groups present were drawing attention to the role that the state of Montana plays in curbing any further rise in global temperatures. The pool of carbon present in Montana coal is a significant portion of the remaining coal that needs to be left in the ground, which many world scientists agree is the most important step in minimizing the predicted effects of climate change. While world leaders continue to fail to agree on a just and effective climate deal, and politicians like Montana’s US Senator Steve Daines deny the scientific reality of human-caused climate change, groups like Rising Tide and Blue Skies Campaign are confronting the root causes of the climate crisis by calling for an end to the extraction and combustion of coal, oil, and other fossil fuels. Actions against coal train traffic have taken place twice before on railroad property in Missoula, in March and August of last year. Thursday’s action was an escalation of nonviolent tactics over those past actions. Montana Watershed Event – Flood the System Presentation Tomorrow! This coming Wednesday, September 2nd, we will be facilitating a training, presentation and discussion in conjunction with Seattle Rising Tide about Flood the System. There will be a presentation of the graphic narrative created by Rising Tide North America, a tool used to explain how we can rapidly grow the grassroots climate movement while making it accessible to people fighting for all other forms of justice (social, political, economic). It is a grand effort to connect all of these struggles in a coherent way. There will also be a brief training on Non-Violent direct action and how it plays a role in this effort. The training will wrap up a with a localized discussion of the issues we face in Montana and how/when we can take action. Please consider coming to this presentation. It will take place from 5-8 pm in the large meeting room of the Missoula Public Library. There will be snacks and drinks provided.